Get the results and findings from Spark Hire's survey of 500 talent acquistion professionals. Is your organization expecting to grow in the coming years? In our latest survey we found 77 percent of companies plan to increase their staff by 25 percent in the coming year. We surveyed 500 talent acquisition professionals from some rapidly growing companies to uncover what they’re doing differently. Are they using different tools? Do they follow specific trends? What are their goals? 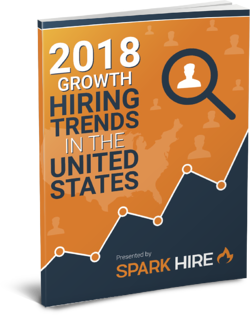 Download the report and you'll learn how top companies are hiring for growth in 2018 and beyond. Complete the form so we know where to send the report to. Check your inbox after submitting the form as we'll send you the PDF right away.